In May I’ll be heading back to New York to exhibit in my fith NYC surface design/art sale and licensing trade show. Over the past year I have been honing my new style and allowing myself to create more freely with a shift in my focus and approach. Here’s why. So often when we create art that we want to sell or license, we as designers can get sidetracked or distracted by all the possibilities and lose focus on the art we want to create and what will ultimately be our best and most unique work. Instead of creating and finding the best clients to fit our work, we see clients and think I could make something that fits them. See the difference? While it is usually true, we can make something to suit, it isn’t necessary something authentically “us”. I’ve made the conscious decision and effort to keep working on my art in a way that I enjoy and to embrace the challenges that come with that. As I work to repopulate my portfolio I’m constantly checking in with myself. Is this “me”, am I enjoying working this way? What’s next? So far I know I still love illustrating flowers and portraits and recently I’ve found a love for illustrating animals in a semi realistic style. Here’s a time lapse video showing my process illustrating the above design in Procreate in the iPad Pro. I’m back from my blogging hiatus! It’s been such an incredibly long time since I’ve posted here but I’m looking forward to sharing more of my process, news and behind the scenes moving forward, starting with my latest creative purchase. 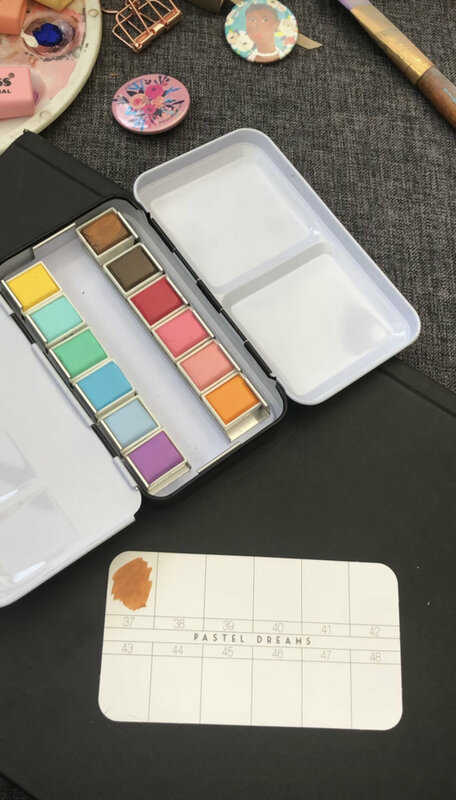 In my quest to try and make my practice my portable and mess-free since the arrival of our youngest little lady, I treated myself to a new watercolour tin set. I opted for Pastel Dreams by Prima Marketing Inc, which I found for £22.40 on eBay here in the UK, and I have to say I’m quite excited about them! Here’s a quick vid of me unboxing and testing them out. Though the colours are pretty rich and seem more opaque on the tester card than I had anticipated (which I was pleasantly surprised about), they do also work well when watered down further, as you can see on the back of this scrap envelope where I cleaned off the brush after each colour. A few people have asked about the brush I used in the video. This one is part of a 4 piece set of water brush pens by Stationery Island. I’ve tried a a fair few differ version of these brush pens at different price points and these are definitely the best for price and quality combined. They’re readily available on Amazon and don’t leak or drip water uncontrollably. The bristle keep their shape well and clean off easily too. The other brush pen I also recommend is the Pentel Arts Aquash Water Brush. I actually use mine filled with black ink as a handy ink well and brush combo in one, which is perfect for me to pop in my bag - like all the time. I’m never without it. It’s a little fatter than the above brushes and easy to fill with ink, but most importantly the flow of the pen isn’t impacted by the fact I have ink in it rather than water. It never gets blocked and as long as I remember to put the lid back on (I’ve been know to lose them… a lot) they brush tip remains i good order and ready to go at each use. I’ll be back at some point with more tips, hack and reviews as I continue to experiment. Let me know if there’s anything in particular you want to know or see. I've been a busy bee since returning from exhibiting at Blueprint this May, but finally I managed to get back to unwinding in my happy place: painting. 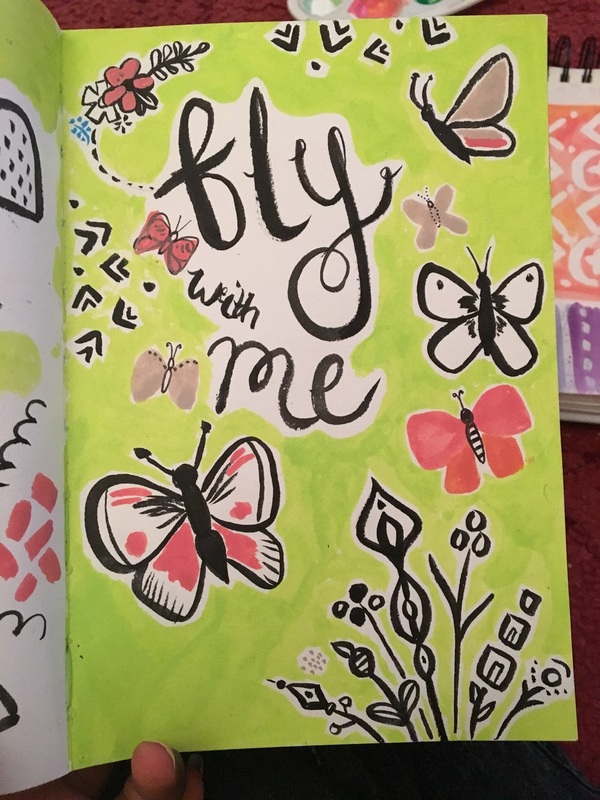 Last night I pulled out my paints and brushes, a selection of sketchbooks and papers, then without rhyme or reason, I mixed and painted to my hearts content. No plan, no rules, just paint therapy....bliss! I don't have a definite end goal for these peta led beauties but, my gut is saying stationery, gift wrap and greetings! I love this part of the process, where all options are open and I'm excited to see where it goes. It's also usually the prelude to the fear and self doubt that can't start to creep in "what if I mess it up, can I remember how to pull designs together, what if it doesn't look as good as I imagine...."
By now I know myself and my workflow well enough to anticipate and conquer my inner self doubt monster. I simply remind myself to trust the process, it may look worse before it looks better, but finished is better than perfect. The clock's a ticking and I cannot tell you where the time has gone! It's a been a whirlwind 8 months since I signed up to do a Masters, relaunched my workshop FolioFocus and signed up to exhibit at Blueprint. I usually exhibit at Surtex (taking place the same time just a block away) but decided to see if this show will be a better fit. As the weeks wind down, I'm working on a few finishing touches and last minute prep before it's time to head back to New York for the show. I will document the show and how I find it, as I know it will be helpful for anyone else considering making where best to exhibit. If you'd like to check out some of the amazing designers who will also be exhibiting at the May New York trade shows, have a look at these Trade Show Preview Posts over on Rise Design and Shine. At the moment I am beavering away, trying to get ready for Dot & Flow's first time exhibiting at Blueprint (a surface design and print trade show) taking place this May! After two consecutive years of doing Surtex, it's a little nerve-wracking to change to another show, but having done my research and weighing up the pros and cons, it feels like the right move to make. Only time will tell! The show will take place just a block away from the Javits centre (where Surtex takes place) at 404 and the space looks great inside. I'm thrilled to see who are booth neighbours are and can't wait to meet some people I have either been following and or interacting with in the design community online, as well as some old design friends. I'm busy working behind the scenes on a great new creative hub for designers and creatives in various stages of their design career. Rise Design and Shine will be a place to find useful insights, tips, downloads and how-tos. Watch this space, you'll be the first to know when we have our big launch! 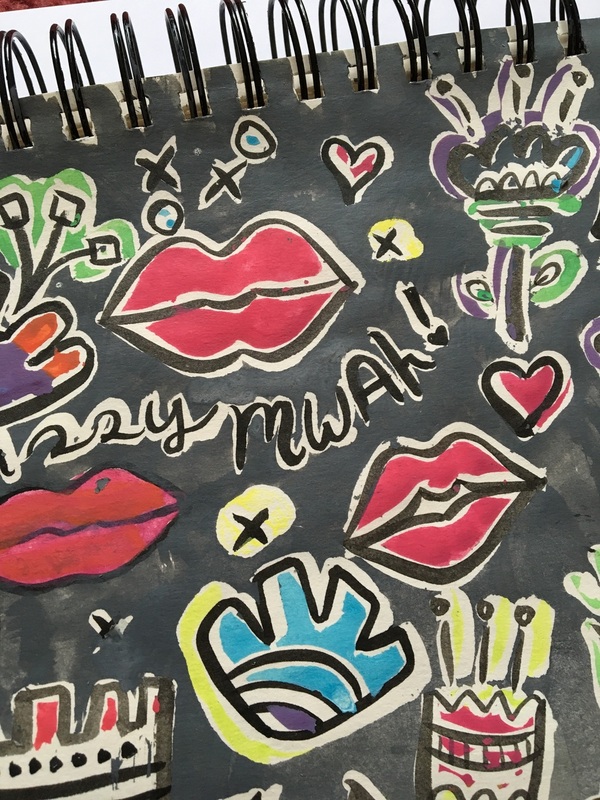 It's National Lipstick Day so I thought I would take the opportunity to work up a fun lippy inspired repeat pattern - why not right? Yesterday I noticed a welcomed change to Periscope, your video streams are now automatically saved so they are available for viewers to watch again and again. Before this update, users' scopes were deleted after 24-hours. There was (and continues to be) the option to save your broadcasted videos to your phone, which could then of course be uploaded to YouTube or Vimeo, however, this posed a problem if phone storage space is low. With the recent and sudden departure of the handy site Katch, an automated service that saved your broadcasts and also tweeted about them and even allowed you to download, share or embed the videos down the line, this new option directly within Periscope will be welcomed by many. Reasons NOT to save your videos! 1- One great aspect of the short 24-hour viewing window was the sense of urgency created, which often encourages viewers to either jump into broadcasts while they are live or make a real effort to watch them before they are removed forever. Consider keeping special broadcasts or promotional/ interactive scopes set to the 24-hour removal set up to create a buzz. 2- Monitor your engagement and views after you make the switch. If you find fewer people are showing up to your broadcasts or catching replays, perhaps you should return to the old model. 3- As with everything you put out into the world take time every now and then to step and reassess. Does all the content you have available still represent you and your current goals? If the answer is no, go back and clean up your account so you have only your very best content on show. Ta-dah! All set up and ready for Day 1! This year I went for 2 small soft cover portfolio books, they were easy to handle and flick through, and have two came in handy with a booth our size. My Dot & Flow colleagues opted for blurb large square and large landscape hardcover books. There was no shortage of eye candy in our booth, that's for sure! Here’s a little sneak peek at me creating a new portrait design in my sketchbook. I decided to paint Frida Kahlo as part of my tropical collection. This will be part of a series of portraits featuring my favourite painters, each accompanied by a coordinating pattern. I think these will make a really cool stationery collection for designers and art lovers like myself. I began by sketching a loose portrait and placement for the giant balloons. Followed by inking the main border and Frida herself. I decided to sketch a little more detail in the background before using acrylic inks to paint in the flora and fauna. SURTEX 2016 Here I come - Meet Me in New York! I'm super busy beavering away on my portfolio ready for Surtex so I've been a little on the quiet side but I wanted to pop by and share my new facebook header/Surtex flyer! I'll be exhibiting at this year's show in booth 244 and I would be honoured if you'd stop by and say hi. Here is a little behind the scenes look at me editing a design from my sketchbook in Adobe Photoshop. I mostly work in Illustrator but as I already added colour and was quite happy with the overall layout and motifs I opted for PS so I could preserve all the lovely painterly details. I'm very happy to hear that my Jazzy Kitchen collection has been shortlisted by the creative team at Hallmark Cards. I designed and submitted my utensils, teak and kitchen containers patterns to be featured in MOYO magazine following one of their briefs and the designs have been picked in their top 10 designs - whoohoo! Hello everyone, I hope you're having a lovely weekend. I just wanted to share something I've been working on which I hope will be useful especially to some of you who are getting ready for your first time exhibiting at SURTEX. I've been working on a series of periscopes, checklists and templates to deliver over the coming weeks to help us all keep on track and have a show stopping SURTEX 2016! You can catch the first broadcast this Monday at 4pm GMT (11am EST, 8am PST) from @NatWillsDesign on Periscope. The first printables and a recording will be available after the scope, more details to follow. If you are on Linkedin we also have a networking group which you are welcome to join. Please keep it professional, (you never know who might be in the group) and feel free to showcase and promote your work and progress and be sure to help and encourage others, giving feedback is great and helps us all grow. Over the next few weeks I will be covering booth design and display, marketing, promotional materials, logistics, time management and plenty more. Most importantly, if there is something that you really want to know more about or a question you have, please don't hesitate to leave a comment or get in touch. Here's to an amazing show! There's no better way to start the New Year than with a clear focus for your business and your hopes and dreams, and more importantly PLANS to make these dreams a reality! I'm not a fan of the term New Years Resolutions, there's that unspoken rule that you can let your resolutions slip a few weeks or months into the year and a bit of an "ah well you gave it a shot" attitude. Nope, not for me, not for my business. I have every intention of seeing this thing through and I'm sure you do too! I do think the buzz, motivation and excitement of entering a new year is definitely a great opportunity to take stock and get planning for the year ahead. Allowing yourself to both be wildly ambitious and meticulously oranised. Dream big and then work back to find the steps to get you there. The first (productive) thing I did today was to complete this 2016 Goals List, noting down a few key things I plan on improving, trying out and learning as well as things I should really try and cut out! I've taken a photo on my iPad so it will always be to hand and I'll also be pinning one up by my desk. I'd love to hear what your goals and plans are, perhaps we could help each other stay on track! I'm in the throes of preparing to exhibit at Surtex 2016 with Dot & Flow Design. I'm super excited to get back out to NYC and showcase my work again. I recommend popping over to Dot & Flow's site for a peek at what's to come and if you're a fellow designer wanting to send your designs to Surtex have a look at the portfolio package. Happy New Year everyone. I wish you a year of wonderful experiences, achievements and happiness!